The Mice (NGC 4676A and B). Credit: NASA, H. Ford (JHU), G. Illingworth (UCSC/LO), M. Clampin and G. Hartig (STScI), ACS Science Team, and ESA. 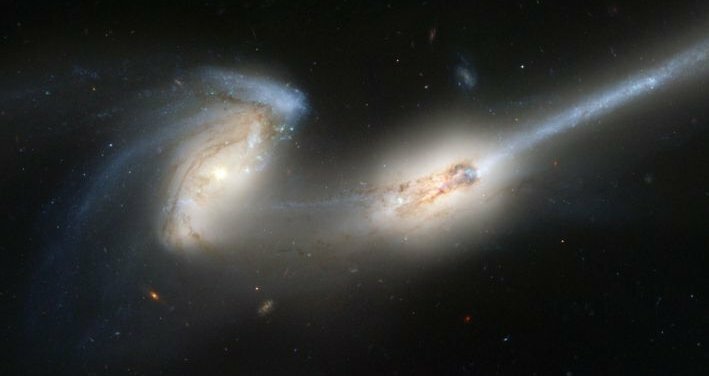 The Mice (NGC 4676 A and B) are two spiral galaxies, about 300 million light-years away in the constellation Coma Berenices, that are in the process of colliding and merging (see galaxy interaction). Their name refers to the long tails produced by tidal action – the relative difference between gravitational pulls on the near and far parts of each galaxy (see tidal tail). Each spiral has likely already passed through the other, having made a closest approach about 160 million years ago, and will probably collide again and again until the two systems coalesce to form a giant elliptical. Because the distances involved are so vast, the whole process seems to take place in slow motion – over hundreds of millions of years. The Mice give us a foretaste of what may happen to our own Milky Way several billion years from now when it collides with the Andromeda Galaxy. They appear to be members of the Coma Cluster of galaxies.